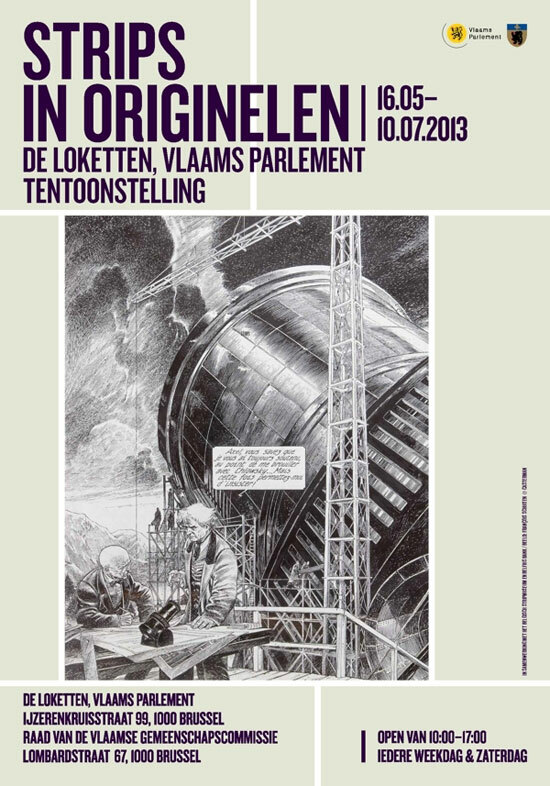 Strips in Orginelen [original comics] is an exposition in the Flemish parliament in Brussels. The exposition shows about 200 original comic pages. The exhibition is held from May 16, 2013 until July 10, 2013. The curators Jan Hoet and Dany Vandenbossche collected, in collaboration with a scientific committee (Danny Dewilde, Christian Hoorne, Roger Decadt, Peter Janda and Willem De Graeve (The Belgian Comic Strip Center)) more than 200 original drawings of comic drawing together of several generations of cartoonists in two locations in the Flemish Parliament and the Flemish Community. The cooperation was obtained from the Belgian comic strip center, the Belfius collection and various lenders 1). The announcement poster features an image from François Schuiten. The image is taken from the album L'Enfant Penchée.